Enhanced automation for a faster, retail-standard returns process. 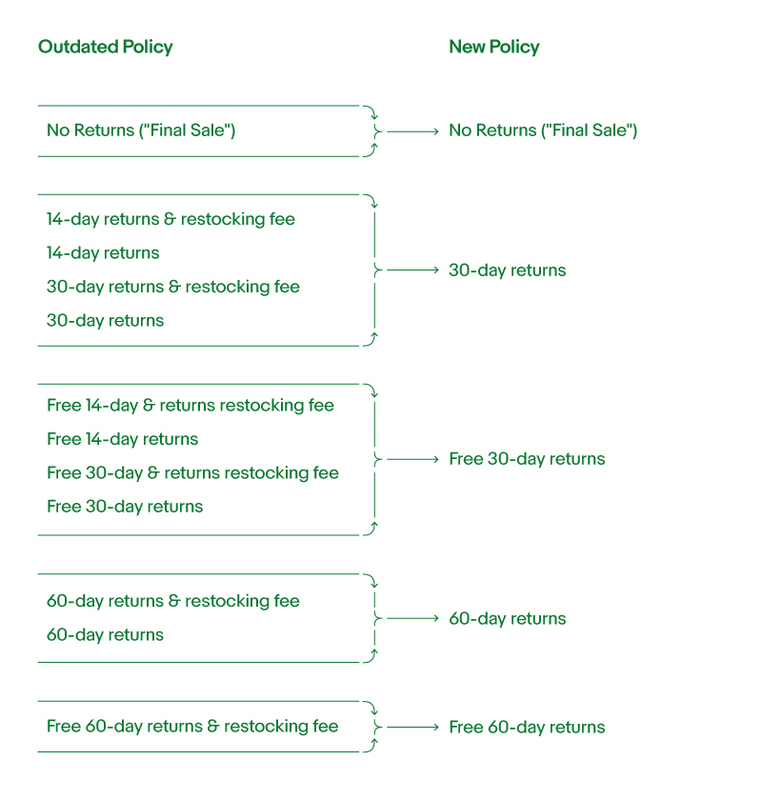 New returns policy options will automatically be updated. New partial refunds guidance for buyers and sellers. Customize your international return policies. Starting July 2018, we will automate two steps in the returns process for buyers and sellers. The changes will save up to a week of processing time for you and your buyer. We are expanding our returns automation and may immediately accept a return request by providing a return shipping label to a buyer when you receive a return request. You will have two business days to review a returned item and issue a refund. If no action is taken, eBay may automatically issue a refund on your behalf two business days after the tracking number shows a confirmed delivery status. At that time, we will close the return for you with no impact to your seller performance. You can continue to control the efficiency of your returns process by creating rules in your Return Preferences to automatically approve returns or send immediate refunds without requiring the buyer to send the item back. We are streamlining the returns process for buyers and sellers to support a retail-standard returns experience. The change will reduce time and costs required to resolve returns, and reduce chances of a return being escalated, which may impact your seller performance rating. When do return requests qualify for automatic acceptance? As a reminder, if you require a Return Merchandise Authorization (RMA) number per settings in your Return Preferences, we will ask you provide the RMA number before the buyer can send the item back to you. What if my listings don't offer returns? If you receive a request that requires your response (such as a "not as described" request covered under the eBay Money Back Guarantee program), we may automatically provide a return shipping label to the buyer. The cost of the label will be billed to your invoice and no impact will occur to your seller performance. 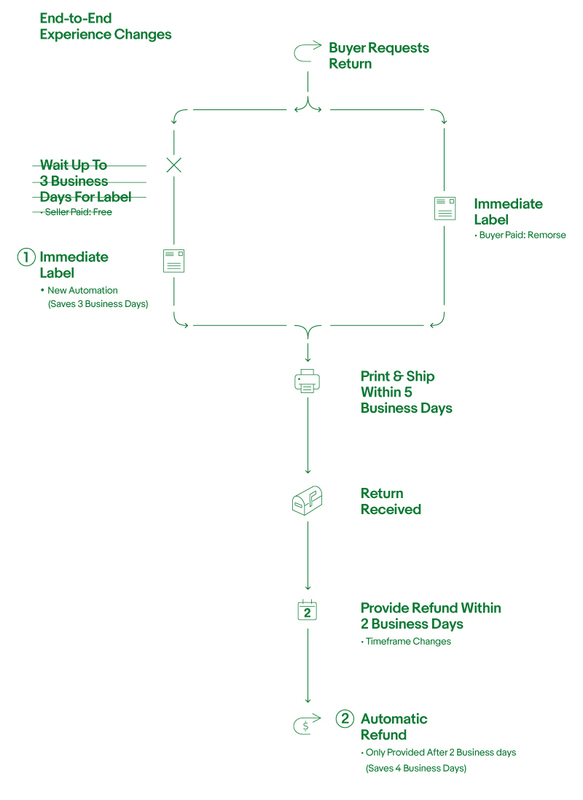 What happens if a return shipping label is not available for the transaction? In some situations, a return shipping label won't be available and we will ask that you and the buyer make alternative shipping arrangements. For example, the buyer may need to obtain their own return shipping label to ship the item back to you. Can I opt out of automatic acceptance? Who pays for the return shipping label? The party responsible for the cost of the return shipping label depends on your returns policy. For example, if you indicate that "buyer pays" for return shipping, the buyer will need to pay for the label used to ship the item back to you if the buyer doesn't want the item anymore. Alternatively, if you offer free return shipping ("seller pays"), you will be charged for the return shipping label used by the buyer. When a return shipping label is provided to a buyer, what type of label is provided? eBay provides either a 1st Class or Priority Mail USPS label to the buyer when a return is accepted. The cost of the label is determined by the weight and dimensions of the package and will cost no more than the original outbound label if it was purchased on eBay. When will eBay automatically issue a refund on my behalf? We recommend that you refund the buyer as soon as you receive the return. However, if the item's tracking information shows confirmed delivery, 2 business days have elapsed, and the refund has not yet been issued to the buyer, eBay may automatically issue a refund on your behalf. eBay will also consider buyer and seller risk and performance data in determining whether to automate a refund. How can I make sure my buyer receives a Return Merchandise Authorization (RMA) number before they send the item back to me? You can decide to offer a RMA number by checking the appropriate box in your Return Preferences page. How can I issue an immediate refund for a return request instead of having the item sent back to me? 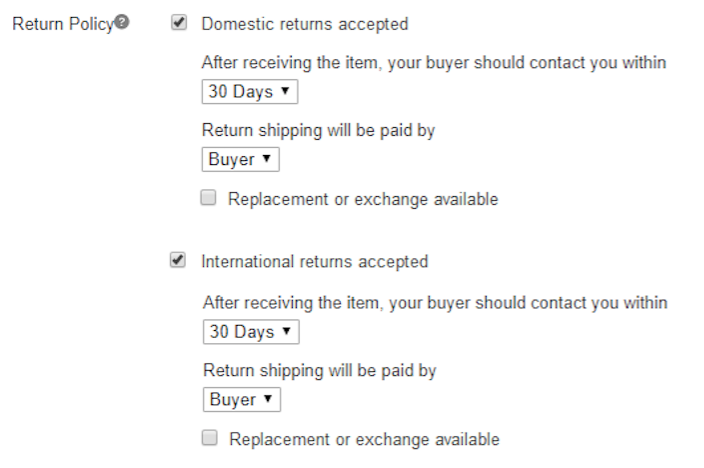 You can set up automation rules in your Return Preferences to immediately refund your buyer and let them keep the item. Can I still offer a replacement or exchange to my buyer? Yes. As long as you indicate in your return policy that you want to offer buyers the option to request a replacement or exchange, this option will still be available. Additionally, replacement and exchange requests will not be automated. I have a return address that is different from the address from which the item was originally sent. How can I make sure that an item is sent back to the correct location? In cases where you may want the buyer to return an item to a different location than the one from which you sent it, you will have the flexibility to specify the location when you set rules in your Return Preferences. Where can I find more information about processing returns? If you have additional questions about processing returns, please visit our Returns page. In our 2018 Spring Seller Update, we announced that we are streamlining our returns policy options to deliver a returns experience that is consistent and competitive with the changing marketplace. Starting in August 2018, listings that you have not updated to one of the new returns policy options, including Good ‘Til Cancelled, will automatically be updated for you. We are making this change to simplify returns for buyers and sellers, and improve the returns experience on eBay. What is the easiest way to update my returns policy? To update your returns policy, go to My eBay (My eBay > Account > Business Policies). Click "return options" when you create or update a listing. If you don’t use Business Policies, you can also update your return policy by clicking "return options" when you create or update a listing. What happens if I update my listings using a third-party listing tool which hasn’t yet updated its return policy options? Beginning in May 2018, if your third-party listing tool hasn’t yet updated its APIs and you continue to create or revise listings with an outdated return policy, we will notify you to make adjustments to your return policy settings to ensure that they are compliant. However, in August 2018, you will no longer be able to list using the outdated return policies. Which categories are exempt from the 30-day free returns requirement in order to receive the Top Rated Plus benefits? Free 30-day returns are required for all categories to be eligible for the Top Rated Plus seal. However, there are exceptions in select categories to receive the Top Rated Plus discount. You are not required to offer free 30-day returns in the following categories to be eligible to receive Top Rated Plus discounts. However, you are required to offer 30-day returns in these categories. As we announced in our 2018 Spring Seller Update, when you offer free returns, you can decide to issue partial refunds to buyers when the item is returned in an altered condition. We have created a new condition of returned items policy to educate buyers that the returned item must be in the same condition in which it was received. If you do not offer free returns, you will still be able to issue a partial refund for items returned in an altered condition in select categories including Business & Industrial, Parts & Accessories, Collectibles & Art, Cameras & Photo, Medical, Mobility & Disability Equipment, Home Improvement, Furniture, Musical Instruments & Gear, and Yard, Garden & Outdoor. We are updating our Condition of Returns policy to provide greater clarity and transparency concerning our partial refunds guidelines so that both buyers and sellers know what's expected when buyers return an item. What will happen if the buyer doesn’t follow the updated guidelines? If the buyer doesn’t meet the criteria in the Condition of Returns Policy, they may be subject to a less than full refund of the item’s value. Starting late May 2018, you will have the flexibility to set separate return policies for your international transactions by updating your return options when you create or update a listing. For example, you can choose to offer free returns domestically, and in the same listing, offer paid returns to international buyers. We will only update your international returns policy to match your domestic returns policy if you accept buyer-paid returns. If you do not accept returns, we will not set a returns policy for international returns. If you offer free domestic returns, we will not change your international returns policy to include free returns. You can set a separate returns policy for international returns yourself. Sellers have told us that it can be challenging to accept or offer generous returns to their international customers due to the cost and ease of facilitating the return—especially free returns. The new feature gives sellers greater flexibility to manage their global returns. How can I set up a return policy for my international buyers? To set up a return policy for your international buyers, simply update your return policy information within "return options" when you create or update a listing. Do I need to update my listings now to take advantage of the international return policy? We recommend that you update your return options if you want to set an international return policy that is different than your domestic policy. However, for listings that are not updated, we will automatically set your international return policy to reflect the buyer-paid version of your domestic return policy. If you don’t accept domestic returns now, we’ll assume that you do not accept international returns. Do I need to create a separate returns policy for international returns if I participate in the Global Shipping Program? Your international return policy will apply to buyers who purchase from the Global Shipping Program.